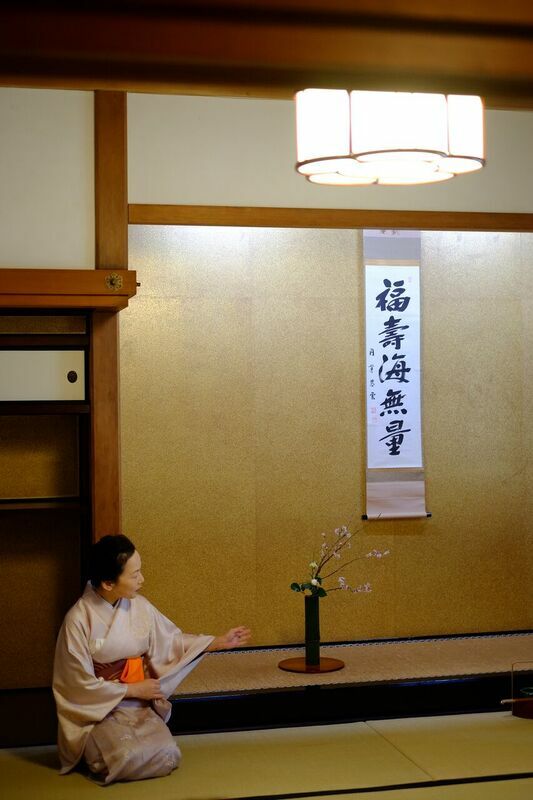 Hanging scroll is written as 福寿海無量 in Japanese. is like the great ocean filled with immense fortune. It is not only superficial fortune but also, I expressed by hanging this scroll, it is a great pleasure to welcome Ambassador’s wife together with IAC members today. earlier than cherry blossoms called 染井吉野 wishing that our guests feel the flashiness of Spring. I could get the fresh bamboo from Kyoto. Freshness of bamboo is only one time and does not last long, so in the tea world by using such fresh bamboo which can be used once in a life time, is the way of expressing host’s hospitality. I placed the lovely Frittilary flower「貝母(バイモ) in the vase which was picked up from my garden. 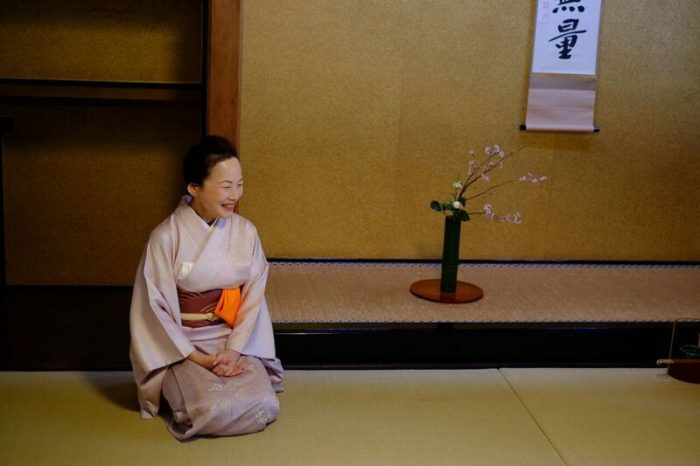 Our Grand Tea Master Sen Rikyu taught us that flowers should be placed as if they are still growing in the field. 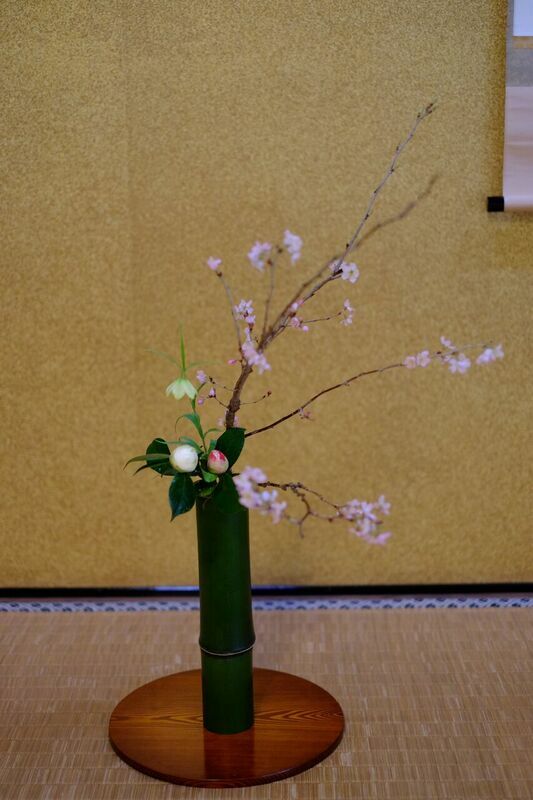 Tea flower is placed in the vase considering the coordination with the season in the area to welcome the guests. Thin tea sweets are named as Pine Wind 「松風(まつかぜ)」which is manufactured by an old shop in Kyoto called Kameya-Mutsu「亀屋陸奥」. 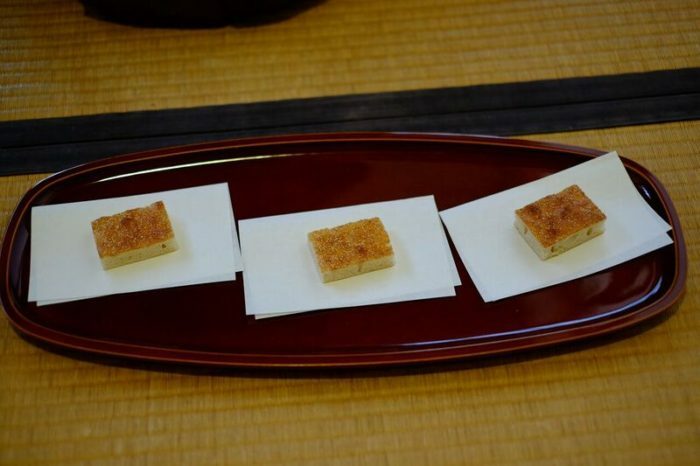 The origin of the sweets was founded as one of food supply eaten at the war-site at where Feudal Lord Nobunaga and Ishiyama Honganji Temple battled with for 11 years. The tea utensil stand is called 「旅箪笥」which direct translation is the traveling cabinet. As you see the tea utensil stand, you may imagine the scenery as if we enjoy the tea in the field. The origin of this tea utensil was founded by our Grand Tea Master Sen Rikyu by the order of Feudal Lord Hideyoshi when he accompanied Feudal Lord Hideyoshi at the time of Odawara Campaign to enjoy the tea even in the battle field. All needed tea utensils such as fresh water container, tea container, ladle, lid rest can be put and kept inside of it and carried on the shoulder to the battle field. 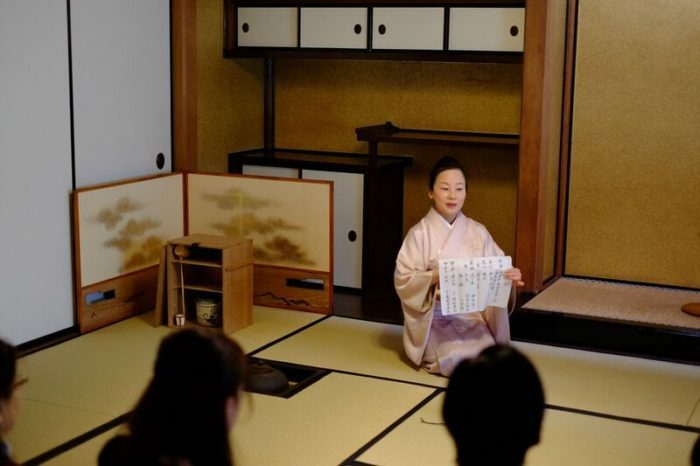 Nowadays the way of tea and the way of flower are considered as the lessons for young women to become a bride but in the Muromachi period they were the compilation of Japanese aesthetic sense which had been accomplished with the desperate effort by men. Having considered those things, I arranged those tea utensils to express and inform these spirits. I am very pleased if all participants can experience the wonderfulness of enjoying the seasonal changes by themselves by attending this tea gathering. I, myself enjoyed the gorgeous and fruitful time with you in the historical residence where Japanese Feudal Lord lived in the old days. I also would like to write new discovery of Japan in my Blog that I felt today. Please get in contact with my Blog and experience it by yourself.